Switch to Veeam! Contact us for a quote today! Every day, more and more legacy backup customers switch to Veeam®. Why? Because legacy technologies designed for the client-server era cannot deliver the 24.7.365 Availability today's businesses demand with the ability to restore any IT service running in the hybrid cloud within seconds and minutes. Check out the top 7 reasons NOT to renew IBM Spectrum Protect and switch to Veeam today! Veeam is a solution specifically designed for your modern, highly virtualized hybrid cloud. Check out IDC’s research to see how Veeam customers meet their recovery time and point objective (RTPO™) SLAs 91% of the time, compared to only 70.7% with their previous legacy provider. Veeam was built to manage the Always-On Enterprise™ of today. Veeam enables you to meet aggressive IT service recovery SLAs that can be measured in seconds and minutes. You don’t have time for troubleshooting legacy backup’s performance or tuning backups via command lines, switches and options. By using an outdated technology, you have invested significant time and resources into the management of your backup environment. Regain those resources with a solution that is both simple and powerful. Veeam is an innovative leader with an established history of being first to deliver market-defining capabilities, support of the latest platforms and the most complete and forward-looking cloud vision in the industry. While Spectrum Protect supports a few select cloud targets, Veeam has fully embraced the cloud with more than 2,600 cloud and service providers licensed to provide services for Veeam Cloud Connect. Spectrum Protect was created in the 1980s to protect the physical workloads of that time. Veeam invented Instant VM Recovery® without additional setup or limitations, automated verification for backups and replicas, Virtual Labs, 2-in-1: backup and replication™ and many other features! 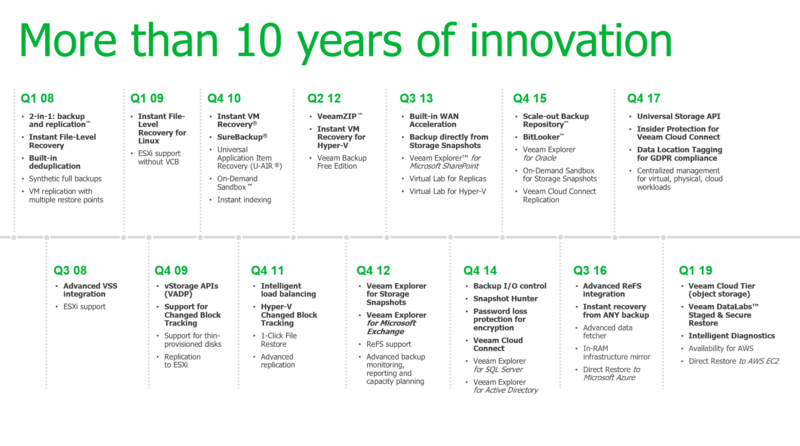 Veeam is one of the fastest growing enterprise software companies in the world. It is a privately held industry high-performer on its way to reaching $1 billion in yearly sales by 2018 with freedom to innovate. Recognized by IDC and Ovum as a top choice among Availability solutions, Veeam’s forward momentum is unrelenting. As IBM continues with layoffs and revenues continue to decline, Veeam’s growth shows no signs of slowing down — adding more than 4,000 new customers every month and new powerful capabilities with every release. Veeam’s straightforward approach to licensing, combined with a near-effortless scalable architecture and deployment, gets you up and running in minutes. With no agents to protect virtual workloads or applications, IDC says that two out of three Veeam customers spend 35% less time managing their Availability infrastructure – freeing them up for more productive tasks. Spectrum Protect’s confusing PVU licensing, complicated Front End capacity licensing and multiple ordering options may make it difficult for you to find the right solution and to understand how future licensing may be impacted in your fast-growing enterprise. With industry-leading features such as instant, agentless recovery for Tier-1 Microsoft applications, built-in WAN acceleration, secure end-to-end encryption, an innovative software-defined Scale-out Backup Repository™ and advanced replication tools that enable near-continuous data Availability, Veeam’s capabilities for your hybrid cloud are unrivaled. While Spectrum Protect is at home in mostly the largest of environments, Veeam is an excellent choice for both departmental and enterprise deployments. Scalability enhancements in Veeam Availability Suite™ 9.5 enable Veeam to protect thousands of VMs and millions of files to ensure Availability no matter your organization’s size. “It Just Works” is the No. 1 feedback from Veeam customers. They report less downtime and fewer backup and replication failures than with legacy backup solutions. In fact, it’s the No. 1 reason enterprises select Veeam! Veeam’s patented automated backup and replication testing AND recovery verification for 100% of your workloads, combined with industry-leading customer support, will help you sleep better at night. IBM has many business units, products and dependable industry-leading solutions. Spectrum Protect lacks integrated virtual infrastructure monitoring, automated backup testing and recovery verification and includes multiple complex components. According to the 2017 Veeam Availability Report, six out of seven organizations lack a high level of confidence in their ability to reliably protect / recover data within their virtual environments. How certain are you that Spectrum Protect can reliably protect your data? Veeam’s customers are overwhelmingly satisfied with our product features and functionality, ease of use, technical support and sales effectiveness. With a Net Promoter Score (NPS) of 73 – 2x the industry average – 9 out of 10 Veeam customers WOULD recommend Veeam to their peers. Don’t just take our word for it: According to the Storage Magazine/SearchStorage.com Quality Awards, Veeam ranked No. 1 among midrange backup and recovery software in initial product quality, product features, reliability and support. In the same categories, Spectrum Protect ranked in the middle or last among its enterprise backup and recovery peers. Customers, partners, industry analysts and media recognize Veeam as the clear market leader in Availability for the Always-on Enterprise, offering unique business advantages due to powerful capabilities. A Veeam representative will contact you shortly. many from IBM Spectrum Protect! Exceptionally happy with the ease of use and reliability of the VEEAM solution. Veeam is an outstanding product that leads the way in Backup & Recovery. It is the market leader with its performance and usability it cannot be faulted. Great work Guys, keep it up!!! One of the main reasons we picked Veeam is because it’s agentless. Maintaining agents takes a lot of time, and we didn’t want to run the risk of going days without backups if we forgot to install an agent on a VM during a software upgrade. IT Systems Administrator Blokker B.V. This Promotional Offer is open to certain end user customer who either currently does not own, or has not purchased a Veeam Software Product in the past. This Offer includes a discounted savings on new licenses of Veeam Availability Suite or Veeam Backup & Replication Enterprise or Enterprise Plus editions only. Savings amount may be variable based on environment size and regional currencies. This Offer includes public sector, internal partner use and education licenses. This Offer does not apply to any other Veeam Software products. An additional two (2) years of pre-paid maintenance may be required for eligibility for some end user customers. Please note that this Offer does not include your support/maintenance renewals; your annual renewal fees will be calculated based on the MSRP of the Enterprise or Enterprise Plus edition at the time of renewal. Veeam may request proof of ownership of a competitive product. This Promotional Offer is available for a limited time only and is non-repeatable. This Offer ends on December 31, 2018.